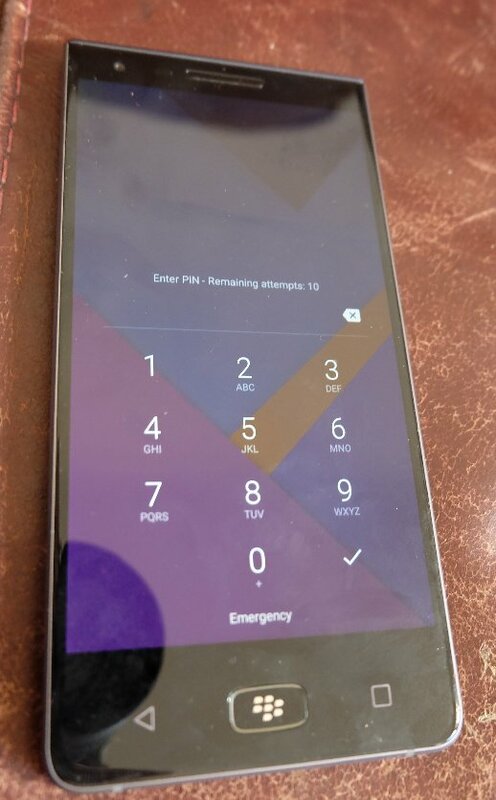 48-Hour Test The oddly named "Motion" – not an odd word, just an odd choice – is BlackBerry Mobile's second phone as a new venture, a quasi-startup housed within Chinese giant TCL. It's a hefty slab of durable, full-touch, midrange metal modelled after a Scandinavian industrial workshop. You may be wondering what's the point? A BlackBerry without a keyboard is like an alcohol-free beer – when you don't need to drive. It took the old RIM/BlackBerry years to make a decent full-touch phone, and after it did, it didn't try again – last year's DTEKs were replated and rebadged TCL Idol phones. I was wondering as much too, particularly as the Motion seems to repackage the KEYone formula of a Snapdragon 625 in a 5.5-inch diagonal. Which isn't terribly exciting in 2017. Well, here's why you may be interested. With the battery charged at around 90 per cent on Saturday lunchtime, I popped in a SIM and (as I do for tests) began using it as my main phone. By the evening, it had barely lost any power, and that after indexing content and pairing with an Android Wear watch. On Sunday I carried on using it for the Sunday papers. The battery barely seemed to be depleting. So I did some Chromecast Audio for about an hour and a half. I was running out of things that would run down the battery. The screenshot taken this (Monday) morning tells the story. This is a phone that reliably gets through two days with plenty to spare, and should get well into the third day. It did so without ever feeling sluggish. No, it's not blazingly fast at loading web pages, as the latest Samsung, Apple and other flagships are – but it's perfectly adequate. The story of the phone is its durability: a 4,000mAh battery and a parsimonious choice of chip. 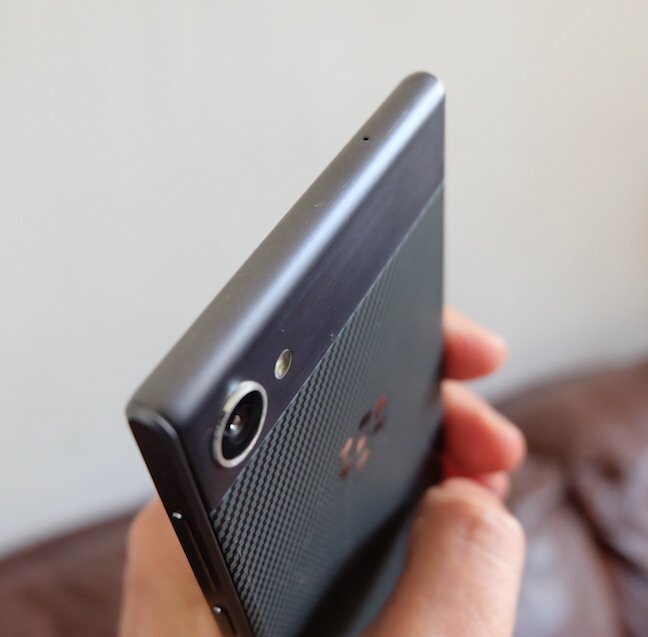 To say this £399 phone is a slab needs qualifying – the industrial chic design emphasises it. At 167g, the Motion is actually 6g lighter than the Galaxy S8 Plus and still 35g lighter than the Apple iPhone 8 Plus. It's narrower too, a full 1cm slimmer than Apple's beast. It's a while since we saw a phone that either packed in a 4,000mAh battery, or could comfortably last two days, or both. They're not particularly common, and rarer in the West than Asia, where Note-sized phablets are the norm. In fact the last mass-market entry for two-day battery life was Motorola's X Play from 2015, which married a 3,630mAh battery to a Snapdragon 615, for a shade under £300 – but this was hard to find, and it often fell just short. The Huawei Mate 9 boasted a 4,000mAh battery and remains a quality bit of kit. But it could struggle to get to the end of a second day, and in tough conditions (at MWC, where I was using both SIM slots) it didn't have much juice by the end. The Motion boasts IP67 water and dustproofing – a first for a BlackBerry – and the claim of "32+ hours of mixed use" is a good one. BlackBerry Mobile also claims that a 50 per cent charge can be reached in 41 minutes, which is good for a day (a real day, not a marketing-claim day). 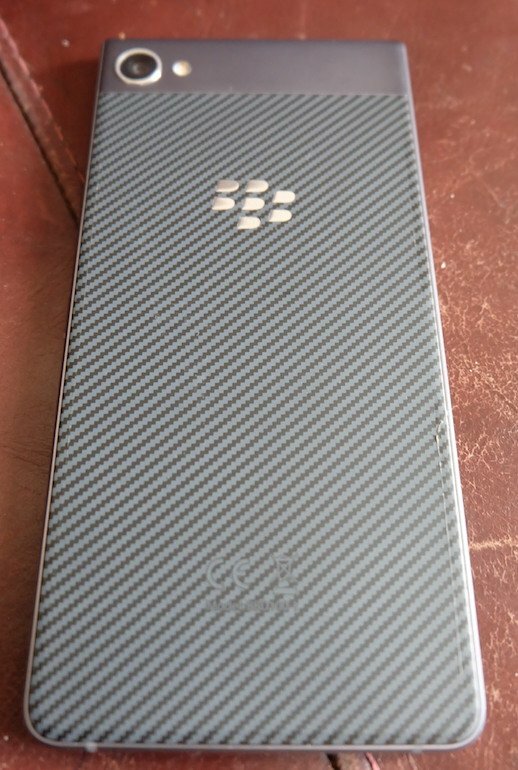 Elsewhere it's clearly a BlackBerry, you can tell it is blindfolded. 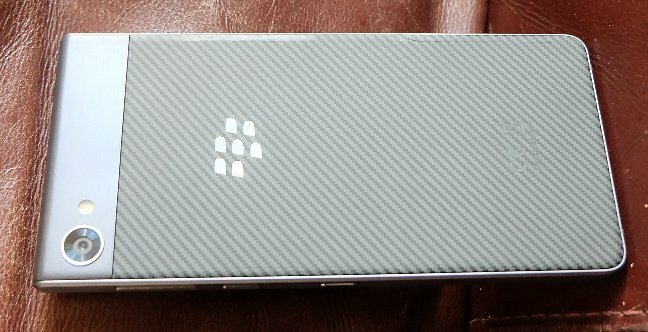 The square topped, round-bottomed design introduced in the Silver Edition Passport and continued in the KEYone. The design gives plenty of room for the capacitive keys, and the BlackBerry-embossed home button doubles up as a fingerprint sensor. It doesn't do anything fancy like cursor control. Overall, it's a fine design with two niggles. All the keys are on one side, with the power key and the textured "convenience key" next to each other. Even though it's textured, I was still hitting the inconvenience key by accident and failing to find the power key. One of these should have been on the other side. The other niggle is that the oleophobic coating could be better, it does seem a little smudgier than other phones, but not as much as the Huawei P10, where they left it off altogether. In terms of software, it's still a light stock-like skin, with a bundled bunch of software, including the Hub email client/notification catcher, and slide-across pane the "Productivity Tab". 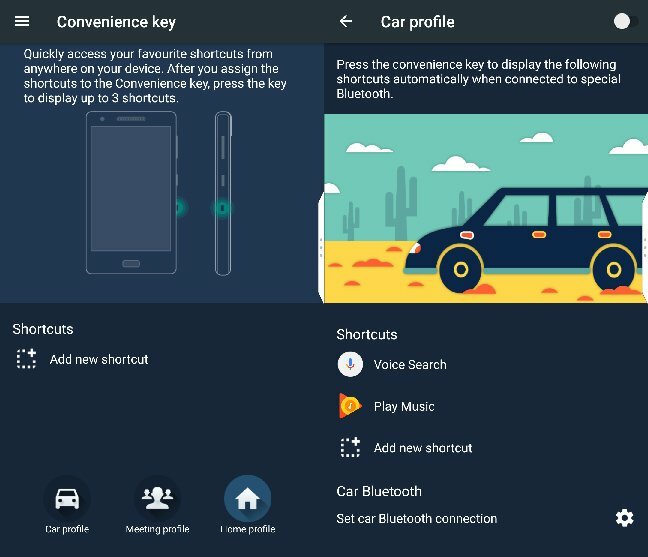 BlackBerry has given the convenience key some useful added functionality. Instead of just one permanent action or app, you program up to three contexts, each of which can pop up a panel with up to three apps or actions. The "Home" context can be triggered when it picks up your home Wi-Fi network, the "Car" context by your motor's Bluetooth and an automatic "Meeting" context when it reads your calendar and deduces that you're in one. It's a little like Moto's old Assist feature with context-based triggers, but simplified and pinned on a hardware key. You can't (yet) change the contexts. And it doesn't do much more than pop up three buttons for each context. But it could mature. As of filing it's informing me I have 11 hours left from the remaining 17 per cent of the charge. NFC, Bluetooth (connected) and push are all on. 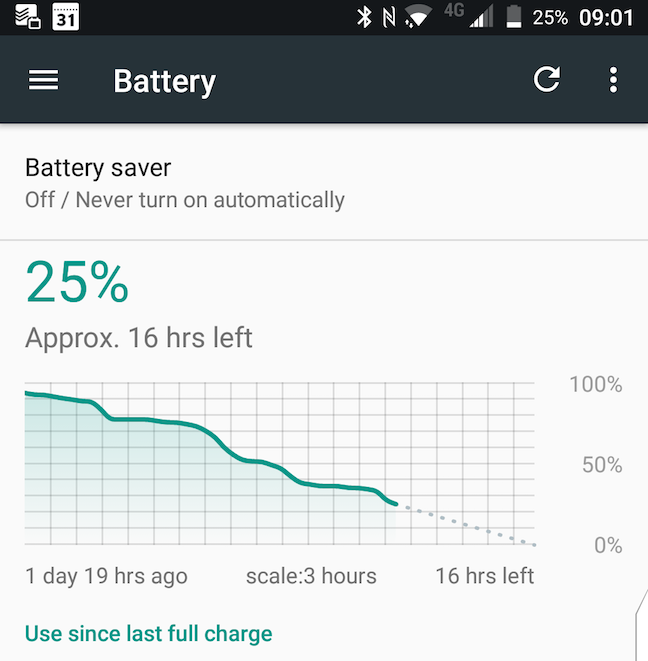 Power Saving was not activated, and no power-saving optimisations were made.